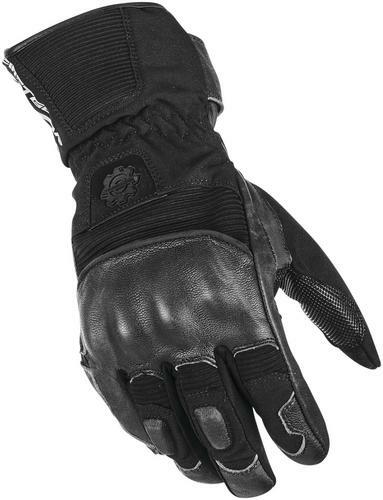 The Axioms aramid-covered D30 padding on knuckles, fingers and palm heel provide impact protection while the waterproof, breathable Hipora lining keeps hands dry for better grip on the bars. 100g Thermolite insulation provides warmth for better control during cold weather rides..
Aramid-covered D30 padding on knuckles, fingers and palm heel. 100g Thermolite insulation for warmth. The Axioms aramid-covered D30 padding on knuckles, fingers and palm heel provide impact protection while the waterproof, breathable Hipora lining keeps hands dry for better grip on the bars. 100g Thermolite insulation provides warmth for better control during cold weather rides.. Waterproof, breathable Hipora lining. Aramid-covered D30 padding on knuckles, fingers and palm heel. 100g Thermolite insulation for warmth. Left thumb visor squeegee. Perfect for cool weather riding.